Dr. Meagan Hawkshaw was born and raised on a dairy farm near the small town of Binscarth, Manitoba. She attended Minot State University in Minot, North Dakota on athletic scholarships for both volleyball and softball. She then went to Pacific University College of Optometry in Forest Grove, Oregon, where she received her Doctor of Optometry with Distinction. During her optometric studies, Dr. Hawkshaw was a member of the Beta Sigma Kappa international honor society. She was also a member of the AMIGOS Eye Care Club where she had the chance to travel to Tempoal, Mexico and provide free eye exams to underserved people. She thoroughly enjoyed this experience and will never forget the many smiles, hugs, and handshakes from grateful patients after giving them the gift of sight. After graduation, Dr. Hawkshaw returned to Canada to practice optometry in Lloydminster, Alberta for a year. Dr. Hawkshaw then worked at Vision North Eye Care in Meadow Lake, Saskatchewan for five years. There she saw all kinds of patients ranging from geriatrics to pediatrics and perfectly healthy eyes to eyes with vision and life threatening diseases. Being far away from a large city gave her the experience and confidence to deal with serious and emergent situations on her own. She is very comfortable treating and managing a wide range of eye problems by herself yet knows when to make the proper referral to specialists when necessary. Dr. Hawkshaw is able to perform comprehensive eye health examinations for patients with diabetes, hypertension, high cholesterol, thyroid disease, multiple sclerosis, and macular degeneration. She does consultations and post-operative assessments for cataract surgery and laser eye surgery. She is certified to diagnose, treat, and manage patients with glaucoma and eye infections from bacterial, fungal, viral, and allergic causes. She can also remove foreign objects (metal, wood, etc) from the front of the eye, saving you a trip to the emergency room. She moved to Edson in the summer of 2016 and became the proud owner of In Focus Optical; established in 1995 by Debbie Burgess. 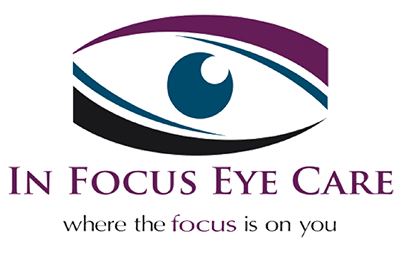 Dr. Hawkshaw changed the name to In Focus Eye Care to signify the change to optometry centred service. In 2017, she extended her care westward, when she took over Dr. Barry Nolt’s patients in Jasper, AB. She worked out of the Seton Hospital before moving to our current location on Connaught Drive. Dr. Hawkshaw is a member of the Canadian Association of Optometrists, Alberta Association of Optometrists, Alberta College of Optometrists, Ocular Nutrition Society, and Women of Vision. She previously served on the Mediation Committee for the Saskatchewan Association of Optometrists. She is currently an Executive Member of the Edson Rotary Club and serves as the Treasurer for the Edson and District Chamber of Commerce. When not at the office, she enjoys spending time with her husband and two young boys, keeping active, and reading a good book. Dr. Hawkshaw hopes that you will trust her with your eye care needs and looks forward to getting to know you and your family! Sabrina was born and raised in Edson. She joined the In Focus Eye Care team in March of 2018 and is a fantastic fit! Her excitement and willingness to learn is a testament to her dedication to providing exceptional patient care. She is always there to give you a warm welcome when you walk into the office and she enjoys interacting with patients of all ages. She looks forward to helping you book an appointment, pick out your next pair of glasses, or get you prepared for you eye exam with Dr. Hawkshaw. When not learning more about the eye care industry and helping our patients see their best, Sabrina enjoys spending time with her boyfriend and family. Ambur Labrecque is the office manager at our Jasper Location. She joined our team in 2019 and enjoys the nonstop learning that the eyewear world offers. She is passionate about eye care and her enthusiasm shows. Whether helping you choose your next pair of glasses or sunglasses, adjusting or repairing your frames, you can always count on Ambur to be there with her friendly smile and caring attitude. In her free time, Ambur manages the Jasper Bears Hockey Team and is a loving mother of two. During the summer you may find her and her family out camping or enjoying the lakes surrounding Jasper. Ambur has lived in Jasper for 12 years and is a familiar face to all of our Jasper patients. Nicole Staves is the office manager and head optician at our Edson office. She is a licensed optician who graduated from the Eyeglasses Diploma Program at NAIT in 2009. She takes pride in her work, whether she is assisting you with frame and lens choices, edging your lenses, or adjusting your eyeglasses. When you work with Nicole, you can expect honesty and professional service. When not at work, Nicole enjoys being outdoors, whether it be on the ball diamond, on the side-by-side, skidoo, or camping with her family. Debbie Burgess is a registered optician and contact lens practitioner. Debbie and her husband, Kelly owned and operated In Focus Optical for 21 years before passing the torch to Dr. Hawkshaw in 2016 who changed the name to In Focus Eye Care. Debbie has been involved in the community through the Chamber of Commerce and Rotary. She is a Past President of the Alberta Opticians Association. Debbie retired from our office in 2016, but can still be seen helping out when needed. She now works on the Curriculum Development team for the Optician Program at NAIT. She keeps busy with her four grandchildren.